NEW BEDFORD, Mass. -Southcoast Health today unveiled a new look and name for the Southcoast Wellness Van. The Southcoast Wellness Van, formerly the Health Van, recently underwent a complete external makeover and name change in line with Southcoast Health’s mission to promote the optimal health and well-being of individuals in the communities it serves. Southcoast Health focuses its attention on increasing access to services and caring for the entire population through wellness initiatives and disease management that are designed to limit – and preferably prevent – the patient’s need for acute care. 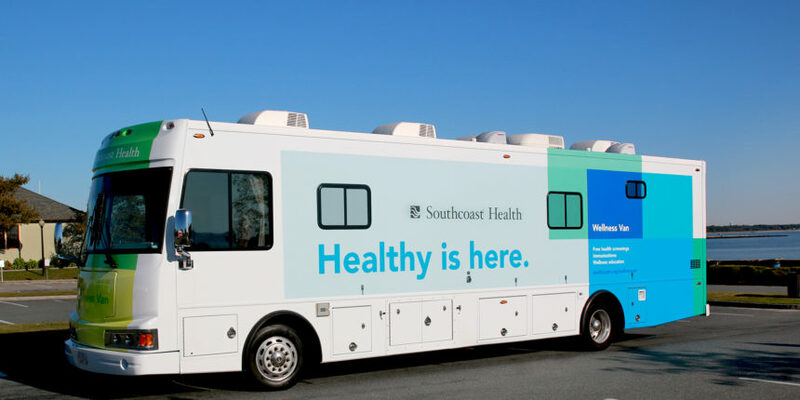 The Southcoast Wellness Van travels across the region bringing free health screenings and vaccinations into the communities of Southeastern Massachusetts. For more information and to schedule an on-site visit, please call Susan Oliveira, RN, at 508-973-8740 or email oliveiras@southcoast.org. A schedule can be found online at www.southcoast.org/van/.